Success can be defined many different ways. For Michigan, for many years, success meant winning or at least being in contention for the Big Ten title. If that's still the case, then Michigan hasn't been very successful since 2006. I don't need to come on here and tell you, Michigan blog reader guy, that this program ain't what it used to be. Everyone knows what struggling looks like. There's no sugar-coating it...its been a rough 10 years or so for Michigan Football. But through all the ups and downs there's always been…somehow, a sense that things will get better soon. This is Michigan, right? The Michigan Difference? Leaders and Best…all that stuff? They'll fire this guy or that guy…hire someone else...move people around, sprinkle some maize & blue pixie dust around and hope for the best. Surely things can't get any worse, right? This is Michigan, fergodsakes. Meanwhile, our rivals are the ones doing all the winning these days. But what Michigan is actually doing and what's been happening for a while now, are half-measures. Since 2004, Michigan's last Big Ten title, they've had 3 head coaches, 5 offensive coordinators and 5 defensive coordinators. At Michigan. At the winningest, most historically elite program college football has ever known, they can't seem to find a coach and/or a staff that can make this thing go again. Rich Rodriguez is a offensive football genius. Literally. And he was run out of town because he wasn't a "Michigan Man". Because he had a funny way of talking. Because he wasn't the obvious first choice. Because Bill Martin epically botched the interview process. Because he was sabotaged by Carr. Because the Detroit Free Press decided to blow up the entire program at exactly the wrong time. Either way, Rich never had a honest shot. And we blamed him for it. And now, here we are again with a head coach who's struggling. Brady Hoke, with 1000% more internal and external support than Rich Rod ever had – although its hard to tell these days, is starting to feel real honest-to-goodness pressure because his teams can't win big games on the road. Because Michigan fans, like all fan bases, hate waiting for success. We just hate it more because our biggest rivals are planting their flags in our front yards in a way never before felt in Ann Arbor. With expectations for this team at an all-time low, and the heat turned way up after the 31-0 shellacking in South Bend, its going to be monumentally difficult for Hoke to dissuade his detractors. He's now faced with the fans' win-or-die mentality…which, fair or not, is the cost of being a college head coach at a place like Michigan…especially this Michigan. And I don't mean to attack the guy, its simply the reality. I like Brady Hoke. I think he's a great coach. I think he cares deeply for Michigan and his players and he values the things that are important at a place like Michigan. And if he were a head coach almost anywhere else in the country, I think he'd be fine right now. But Michigan is a different animal. Coaching tenures since the days of Bo, at least in the fans eyes, seem to have a half-life of 5 minutes. And the more success Notre Dame, Michigan State and Ohio State have, the worse it gets. "RichRod who? Brady who? You mean we didn't get Jim Harbaugh? We didn't get Les Miles? We need a Michigan Man™! Bo said a Michigan Man™ is going to coach Michigan. Brady coached here once? I don't remember him. We need a manlier Michigan Man™." It would seem that a 31-0 pummeling in the season's first major road test was the last straw for a few Michigan fans out there. And how can I come on here and try to say they're not justified in their emotions? Fans are going to start to reject this program, or at the very least adopt a general malaise attitude...which has already begun to occur. Hoke has coached 41 games at Michigan and has a record of 27-14. By contrast, over the course of Mark Dantonio's first 41 games at Michigan State, his record was 24-17. In Dantonio's first 3 seasons, he went 7-6, 9-4 and 6-7. But he beat Michigan twice. And he was also the recipient of something most coaches don't get when they're trying to turn a program around…and that was time. In his 4th season, in 2010, he went 11-2 and tied for the Big Ten title. Since then he's had the most successful coaching tenure of any current B1G coach. I don't mean to rub salt in the open wounds of Michigan fans, but it needs to be noted that Dantonio was and is the absolute perfect coach for Michigan State, and once he was able to get it right, it showed. And boy did he finally deliver last season, his 7th at MSU. Brady Hoke may be the perfect coach for Michigan…and if he is, he will get it right. But the clock is ticking. A close loss last week might've been tolerated, but an embarrassing blowout was like pouring gas on the fire that's fueling his hot seat. How many more losses, or ugly losses this season will be tolerated by this jaded fan base? Another loss like Notre Dame, and it'll be Chernobyl. It seems clear now that Hoke must deliver a win against a team Michigan shouldn't beat...something he hasn't done at Michigan in 41 games. Michigan State on October 25th and Ohio State on November 29th seem like must-wins right now. 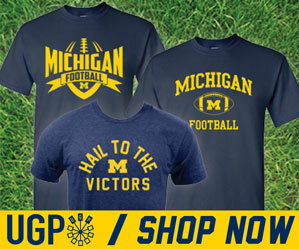 The good news for Hoke and Michigan is that the season is still very young. There's still a lot of time to turn this thing around, and he has a favorable schedule to do it. The chance for a B1G title still exists, and the league is vulnerable from top to bottom. We knew going into this season that Hoke's future at Michigan would be defined by the 3 big road games on the schedule. He's 0 for 1. Kickoff in East Lansing is in 43 days.